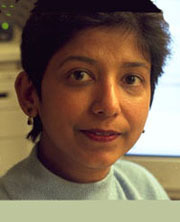 Kalpna Gupta, PhD, is a professor of Medicine in the Division Hematology, Oncology, and Transplantation. Dr. Gupta's main research interests include pain and vascular biology as well as molecular mechanisms underlying the tumor microenvironment and pain. Her work is focused on the mechanisms of pain and pain therapy with opioids, cannabinoids, and evolving novel therapies. Her laboratory developed the paradigm that opioids used for pain influence the tumor microenvironment and promote cancer progression. Another major focus of her laboratory is studying pain in sickle cell disease and discovering novel targets to treat chronic and acute pain. Currently her laboratory is deeply involved in basic and translational research leading to clinical outcomes on improving analgesia in cancer and sickle cell disease. Gupta is the co-leader of the Masonic Cancer Center’s Tumor Microenvironment Research Program. Read Dr. Gupta's full biography.